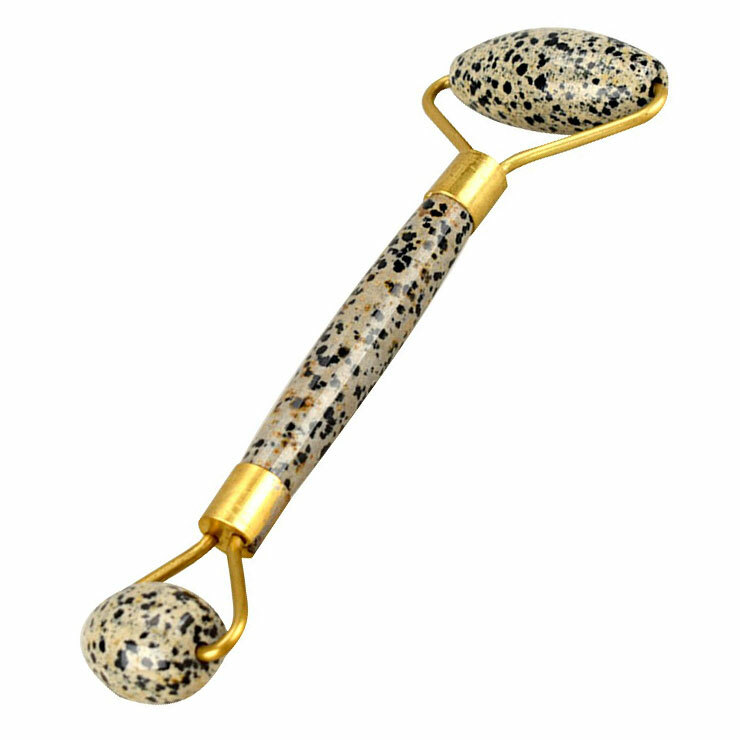 Wabi Sabi Dalmation Gem Stone Face Roller is a beautiful essential for a healthy self care routine. This gorgeous tool is made of natural Dalmatian stone, a combination of quartz crystal and volcanic feldspar that contains spots of black tourmaline. Dalmatian stone has long been used to lend sensations of calm, boosted immunity, and detoxification. Regular use visibly improves upset skin issues and creates the appearance of a plump, smooth, youthful complexion. This beauty looks too pretty to stash away and makes a lovely accessory for any vanity. Gently roll the larger stone across skin after applying facial serum or oil, massaging and pressing in upward and outward motions. Next, gently roll the smaller stone under and around the eye area to create a look of revitalization. Store roller in the refrigerator for a cooling sensation that diminishes the appearance of puffiness.